The Czech general election has ended in deadlock with the conservative opposition slightly ahead but with no clear prospect of forming a government. Exit polls suggested a decisive victory for the Civic Democrats over the Social Democrats after they promised to cut tax and fight corruption. But according to the full preliminary results, they and their allies won only half the seats in parliament. Prime Minister Jiri Paroubek has refused to admit defeat. He said he might challenge the result in the supreme court because of what he called slanderous attacks on him days before the voting. His Social Democrats won 74 seats while fellow leftists the Communist allies took 26, giving them a combined total of 100 or exactly half the seats in the lower chamber. However, as the party with the largest share of the seats - 81 - the Civic Democrats would normally be asked first to try to form a government. The election had been supposed to put an end to four years of political instability, the BBC's Rob Cameron reports from Prague, but the Czechs could be in for four more. An initial mood of celebration at the campaign headquarters of Miroslav Topolanek's Civic Democrats in Prague turned into one of nervous anticipation, our correspondent notes. In the event, their centrist allies, the Christian Democrats and Greens, won 13 and six seats respectively. 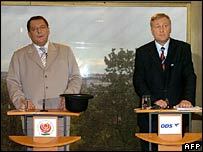 The Social Democrats have dominated the government for the past eight years, steering the Czech Republic into the EU in 2004. Health care, pensions and taxes dominated the campaign but it was also marked by scandals and, on one occasion, a physical clash. Last month, a punch-up between the health minister, David Rath, and a former Civic Democrat deputy leader, Miroslav Macek, was shown on television and later made its way round the world. Earlier this week, the head of a police unit claimed that senior Social Democrats - including Mr Paroubek - had interfered in investigations into organised crime. Mr Paroubek dismissed the claims as a Civic Democrat smear campaign. 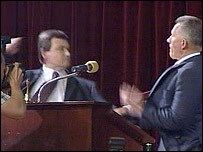 Observers had predicted a low turnout and a strong protest vote for the Communists and the Greens.